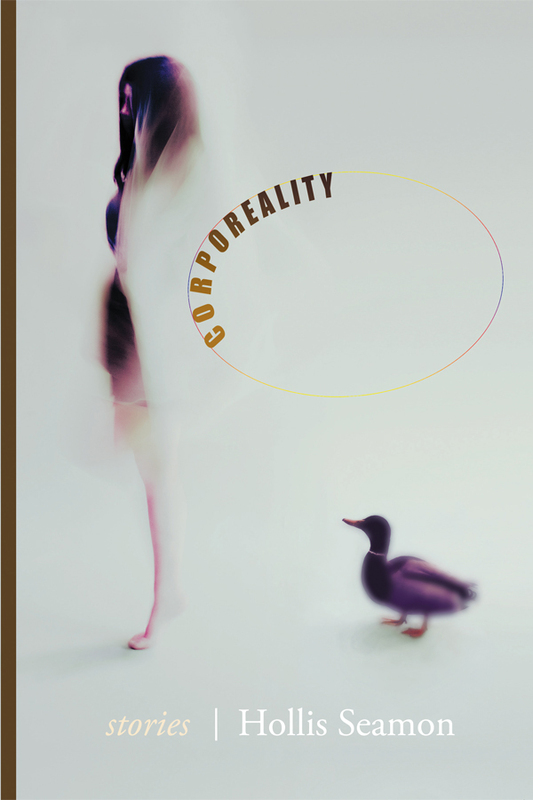 Corporeality is Hollis Seamon’s third book of fiction following the short story collection, Body Work, and the mystery novel, Flesh. The cat lady, the professor who suddenly drops out of the classroom, or another dealing with a plagiarist while coping with personal hardships, sibling rivalry of the unnaturally cursed kind, the dog that goes beyond everyday dog sense and scent to protect its owners—these are some of the eclectic characters and settings that make Corporeality an irresistible collection that is difficult to put down no sooner you’ve started reading it. 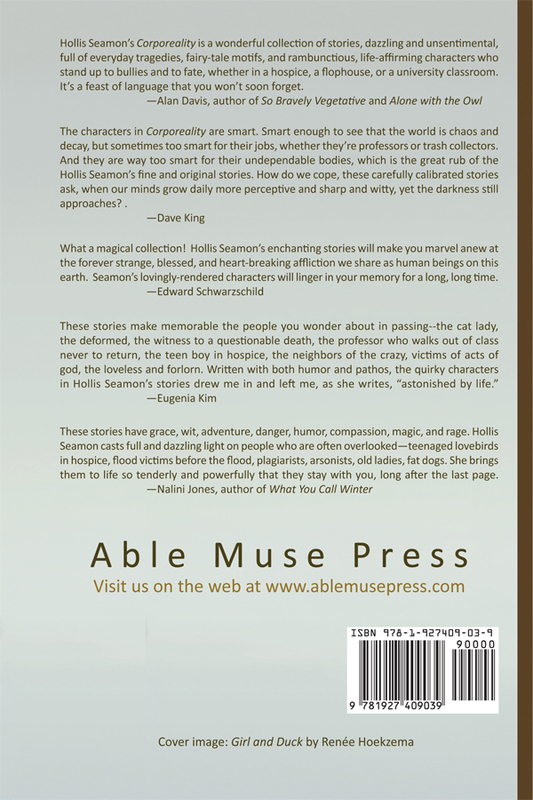 This collection is a testament to Seamon’s ample gifts as a storyteller. Hollis Seamon’s Corporeality is a wonderful collection of stories, dazzling and unsentimental, full of everyday tragedies, fairy-tale motifs, and rambunctious, life-affirming characters who stand up to bullies and to fate, whether in a hospice, a flophouse, or a university classroom. It’s a feast of language that you won’t soon forget. The characters in Corporeality are smart. Smart enough to see that the world is chaos and decay, but sometimes too smart for their jobs, whether they’re professors or trash collectors. And they are way too smart for their undependable bodies, which is the great rub of Hollis Seamon’s fine and original stories. How do we cope, these carefully calibrated stories ask, when our minds grow daily more perceptive and sharp and witty, yet the darkness still approaches? What a magical collection! Hollis Seamon’s enchanting stories will make you marvel anew at the forever strange, blessed, and heart-breaking affliction we share as human beings on this earth. Seamon’s lovingly-rendered characters will linger in your memory for a long, long time. These stories have grace, wit, adventure, danger, humor, compassion, magic, and rage. Hollis Seamon casts full and dazzling light on those who are often overlooked—teenaged lovebirds in hospice, flood victims before the flood, plagiarists, arsonists, old ladies, fat dogs. She brings them to life so tenderly and powerfully that they stay with you, long after the last page. Hollis Seamon is the author of a mystery novel, Flesh; a young adult novel, Somebody Up There HATES You (forthcoming, Algonquin Books); and a previous short story collection, Body Work. She has published short stories in many journals, including Bellevue Literary Review, Greensboro Review, Fiction International, Chicago Review, Nebraska Review, Persimmon Tree, and Calyx. Her work has been anthologized in The Strange History of Suzanne LaFleshe and Other Stories of Women and Fatness, A Line of Cutting Women, The Best of the Bellevue Literary Review, and Sacred Ground. She is a recipient of a fiction fellowship from the New York Foundation for the Arts. Seamon is Professor of English at the College of Saint Rose in Albany NY and also teaches for the MFA in Creative Writing Program at Fairfield University, Fairfield CT. She lives in Kinderhook NY.